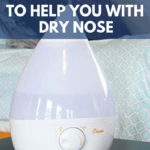 What is The Best Humidifier for Dry Nose? Humidifiers are the best solution for solving dry nose problems. If left untreated, a dry nose can lead to discomfort, but also nosebleeds. When your sinuses are dry, they can cause infections and you will eventually need a medical treatment with antibiotics. Fortunately, these problems can all be avoided if you raise the humidity levels inside your home. The acceptable interval should be in between 40 to 60%.